Folding wall mounted rectangular shower seat with phenolic seat. Seat Size: 22" x 15" 28" x 15" 32" x 15"
Accessorize your safe shower surround with a wall-mounted shower seat. Featuring swing-down legs, the seat can be folded up to save space when not in use. Seats meet ANSI A117.1 and ADA 2010. Folding seat with swing down legs has adjustable rubber feet and friction in the fasteners of the S.S. cross member holds seat in upright position. Seat Surface: Seat surfaces are attached with stainless steel screws. Phenolic seat: solid white 1/2” thick with rounded edges. All seats measure 18" high. Load Capacity: When properly installed, 500 lbs. Installation: All shower seats must only be installed using sufficient in-wall backing material. 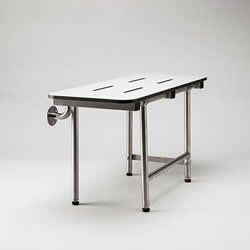 Lead Time: Shower Seats typically ship within 2-3 business days of order processing. Please call for expedited delivery options.